In order to understand the many new varieties of business model being created and why they work, we have to study systems models. However, to understand these organic and natural systems, we have to move from a ‘mechanistic’ way of thinking, whereby we think of the world as functioning like clockwork, engines and computers, into an ‘organic’ way of thinking. To think organically, we first have to radically change our mental models of the world in order to be able to see organic systems whole. 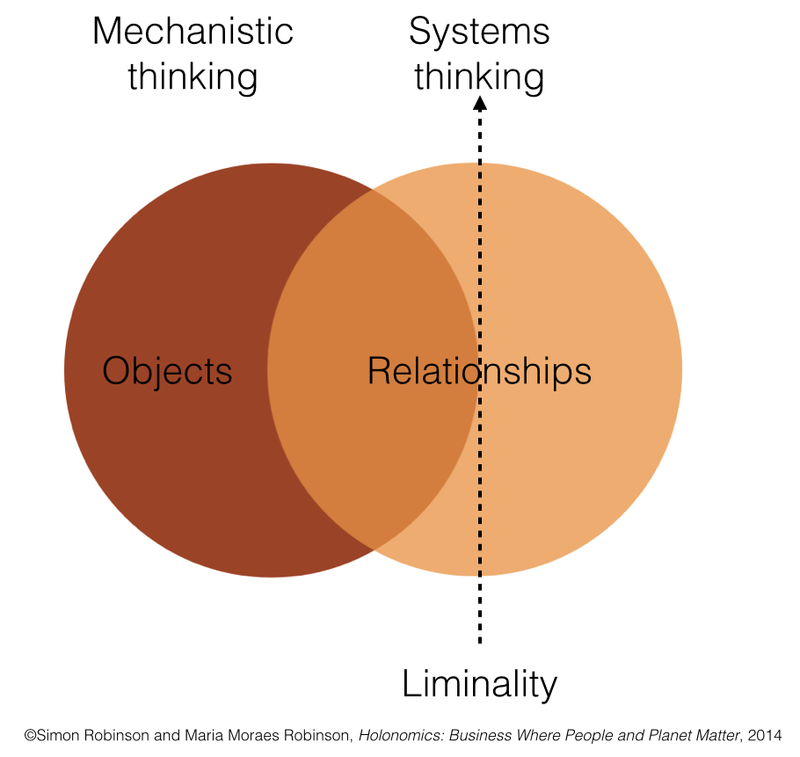 Holonomic thinking, therefore, consists of four components: mental models, systems models, business models and human values. The concept ‘mental model’ refers to the structures, paradigms, frameworks, concepts, ideas, assumptions and beliefs that we hold about the world and about reality. We can think of many outmoded mental models of reality in science, such as the Earth being flat, the Earth being at the centre of the universe, and more recently, continents always being static. When Alfred Wegener (1880–1930) suggested in 1912 that the world’s continents were once one single land mass, he was roundly ridiculed, in an often hostile manner, since how could an entire continent possibly move? The first edition of The Origin of Continents and Oceans, outlining Wegener’s theory, was published in 1915 but would not be widely accepted until the 1950s with the theory of plate tectonics. Seeing interrelationships rather than linear cause and effect. Seeing processes of change rather than snapshots. Senge points out that while business strategies may well benefit from insights from systems thinking, these ideas never get put into practice, or, if they do, the results may fail to meet the expectations of what are brilliant ideas. The reason is that there is a conflict between systemic insights and our deeply ingrained mental models. The ability to shift into systems thinking is a potentially vast source of competitive advantage for businesses, argues Senge, but, in order to truly master this discipline, organisations need to become learning organisations, necessitating the mastery of building shared visions, mental models, team learning and personal mastery. In our daily lives we rarely think about how our mental models affect our seeing. The word ‘seeing’ is highlighted here because it is not being used it in a common sense way. ‘Naive empiricism’ is very closely aligned to our everyday view of the world. In this world view, there is an external world consisting of separate objects. Through light and our eyes and nervous system, we are able to perceive images of this external world and thus know things about it, such as how fast objects fall due to gravity, their weights, and what things are made of. It is only when we consciously move our attention from objects, or what is seen, to the act of seeing that we discover that our mental models have a major impact on how we see. If we come to accept this, then we can see how studying dynamic systems provides us with a new source of mental models, which then opens up to us a new way of seeing the world. Here then, is the first challenge – to move from ‘mechanistic thinking’ to ‘systems thinking’. The trap here is that many people who are systems thinkers are still thinking in mechanistic terms. They still see the world in terms of fragmentation, parts and objects, even though they claim to be thinking in terms of ‘wholes’. In the figure above there is a dotted line which represents a wall, a barrier beyond which many systems thinkers do not go. It represents their inability to break out of their mechanistic world views; it is ‘the point of liminality’. Liminality can be thought of as a human type of singularity point in a black hole, a halfway point in transition, where existing structures have broken down but new ones have not yet been built. The word comes from Victor Turner’s anthropological work on rites of passage and rituals. In indigenous cultures, Turner identified three stages in a ritual process. The first is ‘separation’, where a youngster is taken from their familiar surroundings, their family, friends, and village, with a view to taking them out of all known cultural and social norms. The second phase is the ‘liminal state’, which has no attributes of either past or coming states. In the final phase of the rites of passage, the initiate achieves a new form of awareness, coming out of the ambiguous state to achieve a new sense of wholeness. In first world countries – advanced technological countries – we have lost these ancient rites of passage, and unless we have gone through them, we cannot begin to understand the change of consciousness that they are designed to invoke. Instead, we may experience deep discomfort and frustration, and a lack of truly grasping the importance of what is being taught. 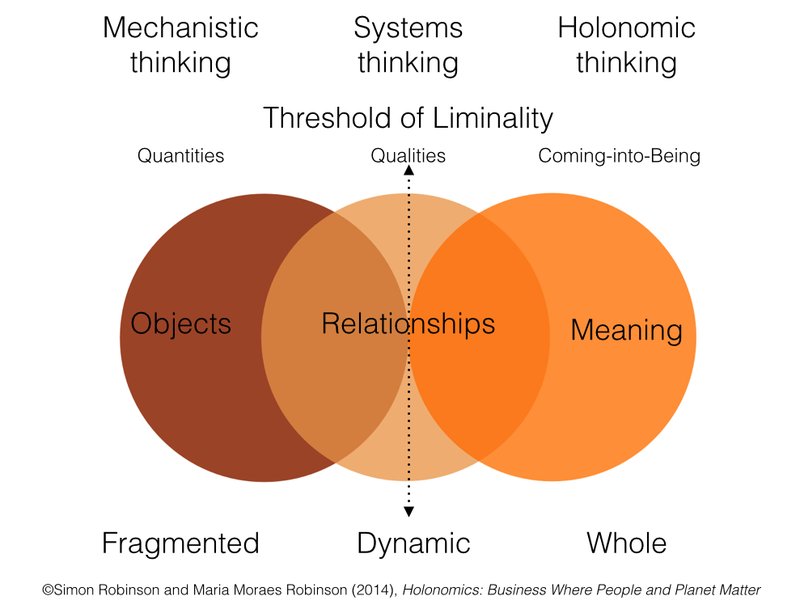 Holonomic thinking is a way of thinking in which our seeing and thinking is expanded. We do not move from one way of thinking to another way of thinking; we stay within the act of seeing, and go ‘upstream’ so that we are able to see the act of seeing itself. Most people are only able to focus on what is seen, the objects. The first chapters in Holonomics examine ‘seeing’ in its entirety, so that we can begin to understand how and why we see objects as we do. If we can somehow expand our way of seeing, we are then given a choice as to how we see a system. Do we see it in terms of its parts, which of course we often need to, or can we see the system ‘whole’? This is not the same thing as seeing the whole system, where we simply try to increase the number of parts or dimensions that we wish to model, describe, or understand in order to get a better picture of the system. Ultimately, then, what we are describing is a movement in thinking – a restructuring of consciousness – to give us the ability to see a complex system whole. As is becoming clear in many scientific disciplines, true understanding can only be achieved through one’s intuition, and not just via rational thinking. We also need to rethink what we mean by a ‘whole’. The aim is to help you to be able to see both the intrinsic as well as extrinsic dimensions of complex systems. Only when you have been able to see ‘authentic wholes’ – the processes, dynamics and meaning of living systems – will you then yourself be transformed by the system, reaching a deeper understanding of both the world and your place in it. Throughout Holonomics we examine case studies from businesses which have all been inspired by nature, having a deep reverence for nature, and a connection to nature, people and our planet; a reverence which does not just come through an intellectual understanding where nature is viewed as some kind of object separate from us. 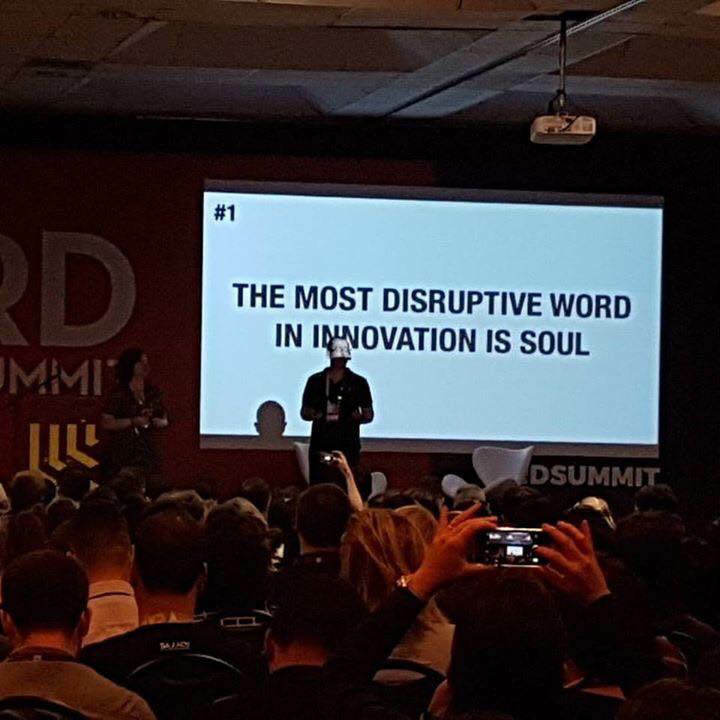 Although we have now moved from the industrial age into what is now referred to as the age of the knowledge economy, it is remarkable how little attention companies and organisations are giving to the process of thought, and how developing new ways of thinking can be a source of competitive advantage which can lead to new creative business models, processes, products and solutions. Luckily, we do not have to undergo intense ritualistic initiations to attain this new way of thinking. We simply need to reacquaint ourselves with nature, and our book has many practical suggestions and exercises to show how this can be done. 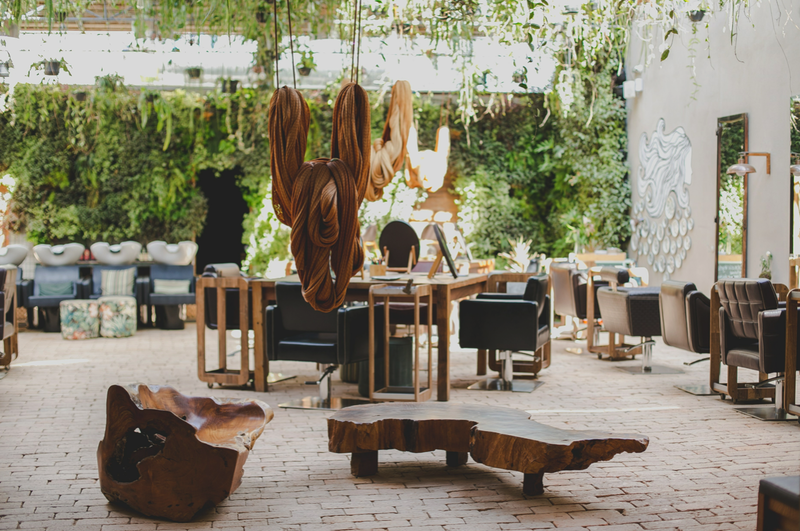 There is perhaps no more successful business consultant than nature, which has already developed solutions to the problems that we humans now face, in terms of constructing resilient and sustainable organisational structures which have survived for many millions of years. When we let nature be our teacher, and enter her non-linear world, we are shown the secrets of her business models, and that wisdom is priceless.